Skype for Business and Lync learnings from the lab and field. Skype for Business Online and Skype Teams are both real time communications tools that rely heavily on the networking infrastructure that they run on top of. This has always been, and will remain, a challenge in cloud deployments for the foreseeable future. 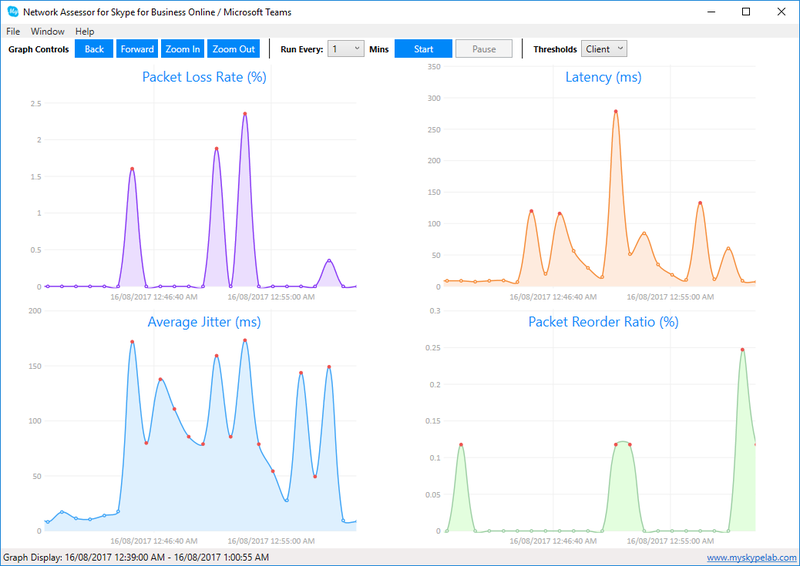 In order to prepare for deploying Skype for Business Online or Microsoft Teams, you need to first ensure that your networking infrastructure will be able to handle the real-time traffic that these applications produce. To help with this, Microsoft released a tool call the Skype for Business Network Assessment Tool. This tool runs via the command line and uses the same media stack that is used by the Skype for Business client to test Packet Loss, Jitter, Round Trip Latency and Reorder Packet Percentage on connections from your network into Microsoft’s Office 365. The audio stream created by the tool gets sent to Office 365 and then mirrored back from the closest Edge server location to your current physical location. Based on the return stream the tool is able to give accurate statistics on Packet Loss, Jitter, Round Trip Latency and Reorder Packet Percentage. This will give you an idea of the how congested the current network environment is and how well you might expect Skype for Business or Skype Teams conferences to function in your environment. Graphs Packet Loss, Average Jitter, Latency and Reorder Ratio. Zoom graphs in / out / forwards / backwards to view the data clearly. Start / Stop and Pause the network tests at the click of a button. Keep an eye on the status of testing using the tray icon colour by setting breach percentage thresholds. This will easily let you know that things are within your desired operating levels without having to open the interface. There are two levels of threshold breaches; one that changes the icon to orange in colour and the other that changes the icon to red in colour. These percentages are calculated on a per graph basis and if any graph breaches the percentage the colour will change. Graphs will automatically highlight in red points in each of the graphs which are outside of Microsoft’s recommended bounds of operation. There are two levels for these thresholds: Client thresholds and Edge Thresholds. For more details see the Usage section below. The status bar will display PASS/FAIL results for each graph. This calculation follows Microsoft's "ResultsAnalyzer.exe" PASS/FAIL calculation which is based on any graph having more than 10% of test attempts resulting in (Client or Edge) threshold breaches will equal a FAIL result. You can select the frequency at which the tool will run tests. This ranges between 1 and 120 minutes (ie. Run a 17 second long test every 1 minute or up to every 2 hours). Allows for graphs to be saved as PNG images for use in documentation/reports. All the graphs can be shown at once or individual graphs can be selected using the “Window” menu item. Graphs are saved at the resolution that they are displayed, so opening individual graphs and then saving them can offer higher resolutions. Every session that is created by the tool gets recorded in a CSV file for future reference. Sessions will “roll” to a new file based on the “Roll Time (hours)” setting in the Settings dialog. Logs can be rolled between 1 and 12 hours. CSV files can be imported back in to the tool by using the File > Import CSV File menu or dragging and dropping the file onto the interface directly from Windows Explorer. Supports automatic download (note: Internet connection is required for this to work) and installation of the Microsoft Network Assessment Tool and VC++ Redistributable pre-requisite by using the Help > Install Microsoft Tool menu item. Support Connectivity Check. Select "File > Connectivity Check"
The Microsoft Tool in its latest incarnation doesn’t handle all exceptions that it throws. These seem to be mostly around when it does the initial lookup REST call where it gets a JSON list of the servers to connect to for testing. If DNS fails or there is no network interface available on the machine the Microsoft tool throws an unhandled exception. If this happens the Network Assessor GUI will report an error and stop running tests. Be careful when trying to manually install the new 5/3/2018 version of the Microsoft Command Line tool because it does not install properly over the top of previous version (i.e. it doesn't install over it and still says that installation was successful). Note: This tool is not intended for load/stress testing! Tested with version 1.1.0.0 released on 5/3/2018 of the Microsoft Skype for Business Network Assessment Tool (LINK: https://www.microsoft.com/en-us/download/details.aspx?id=53885). Do not run the tool on a machine with multiple interfaces. Microsoft’s Network Assessment Tool may fail due to sending traffic out the wrong interface. Note: This is not documented in Microsoft’s documentation but is required. You must uninstall any old version of the tool before installing a newer version. The installer does not warn about this and fails to install over the top of existing versions. Note: Microsoft’s tool should be left with all of the default settings in its config file. For more procedural details on how to do Network Assessments, please refer to the Skype Operations Framework. There is a lot of useful documentation in the Determine Network Readiness section of Planning stage within this framework and should give you a good starting point for running Network Readiness assessments. 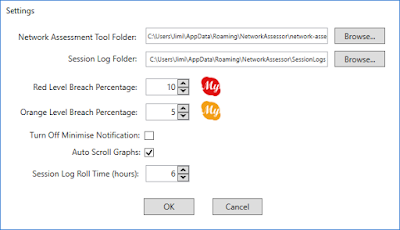 The “Run Every x Mins” setting controls how often the network assessment tool will be run and log results. This value can be set between 1 minute and 2 hours. The Thresolds setting refers to two levels of thresholds that are recommend by Microsoft for real time audio for the statistics that are generated by the Network Assessment Tool. The first is the “Edge” values which are recommended for when you are testing from your perimeter network into Office 365. The second is recommended thresholds when testing from a “Client” subnet. The Edge values are lower and more restrictive than the client subnet because is expected that the client subnet will have more hops to get to Office 365 than the Edge. Note: The value output by the Microsoft tool is not a percentage. Network Assessment Tool Location: This is the location of the Skype for Business Network Assessment Command Line Tool on the system. If you have manually downloaded the tool and unzipped it to a folder on the system you can enter the location via the Browse button. 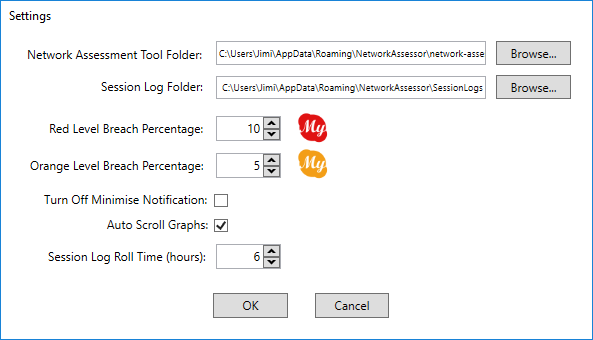 Session Log Folder: The Session Logs by default are placed on the system in the “C:\Users\<Username>\AppData\Roaming\NetworkAssessor\SessionLogs” folder. If for some reason you would like to change this folder (perhaps for centralizing the logs on a file share) you can select a new folder here. Red Level Breach Percentage: This is the percentage of breaches (on a per graph basis) that has to occur for the task bar icon to change to red colour. Orange Level Breach Percentage: This is the number of breaches (on a per graph basis) that has to occur for the task bar icon to change to orange colour. Turn Off Minimise Notification: When this check box is ticked it will turn off the task bar notifications. Auto Scroll Graph: When this check box is ticked it means that the graphs will automatically scroll when new points are added to it graph. Roll Time (Hours): This is the number of hours of testing that will be logged to CSV until a new session log file is created. When the file rolls the graphs will also be cleared. This is to try and maintain the performance of the graphs. Also, when the graph is cleared the breach counters will also be cleared. Hopefully this post will give you another tool in the toolbox to help you in your preparation for deploying Skype for Business Online or Microsoft Teams in your environment. If you have any comments or issues with the tool please provide feedback below. I'm a Lync / Skype for Business Architect and MVP working in Melbourne Australia. This is a personal weblog. The opinions expressed here are my own and not those of my employer. Copyright © 2015, James Cussen, All rights reserved. Powered by Blogger.